Includes all canoe and camp gear, shuttles, river description, menu plan, all your food packed in waterproof barrels and a hotel room for the first and last night of your trip. You don't need a guide for your Yukon canoe adventure: then let us do the organizing - you do the trip. Transfer Rates based on 2 people 1 canoe , gear. Larger group rates upon request. Free consultation for choosing the right river trip in the Yukon. Knowledge of paddling and guiding on Yukon rivers for over 25 years, with first hand river information about most Yukon river trips. The person answering your e-mail or phone call is also a professional Yukon wilderness guide you might see on the river while you are on your trip in the Yukon. Our Yukon rental canoes are 17 Feet Old town Discovery or Nova Craft Prospector canoes. With an extra seat it will allow for an additional passenger. We arrange floatplane charter flights for fly in trips like Wind River, Snake River, Liard River, Stewart River. During your canoe trip, we will store your excessive luggage. We rent all the camping gear you need. Just let us know what you need ;or, we'll help you plan it out. Menu planning and Food Service. We take as much time as needed once you are in the Yukon, to get you well prepared. Canoe rental includes: 1 Canoe (Old Town Discovery 169 or Nova Craft, 17 feet (max. carrying capacity 1000lbs), 3 paddles, 2 Lifejackets, Ropes, Bailer, Sponge. 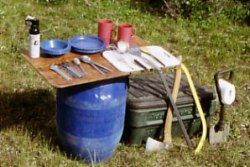 You can rent the complete cooking and camping gear, and waterproof storage barrels, just ask! The day before we drive you to the river, we take the time and meet you in Whitehorse, talk about those last questions prior to your trip, and give you the waterproof containers to get organized in a relaxed way. If your canoe trip starts in Whitehorse (on the Yukon River), or if you fly to the start of your trip out of Whitehorse, the transfer from your accommodation to the river or the floatplane base is included in the canoe rental. For canoe rental arrangements we require a damage deposit of Can. $ 500.- per canoe, fully refundable upon returning the rented items. By selecting a river for your trip, always consider your experience and skills. Shuttle Rates are based on 1- 2 people, personal gear, and rental canoe from Yukon Wild. Transfer Rates for small groups (3 people an up) und other destinations upon request.